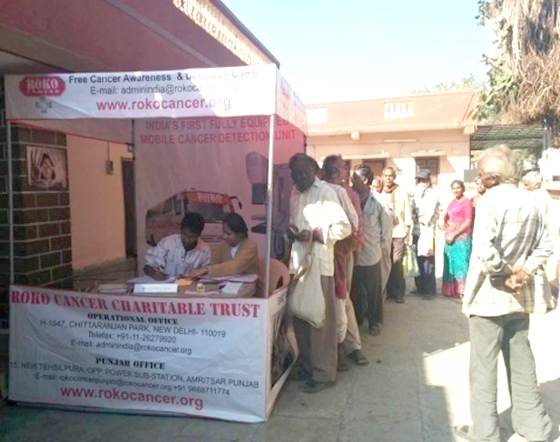 Roko Cancer Charitable Trust conducted a series of Cancer Awareness and Detection Camps in Gujarat from 5th January to 11th January 2014. These camps were first of its kind and witnessed a large no. of foot fall. 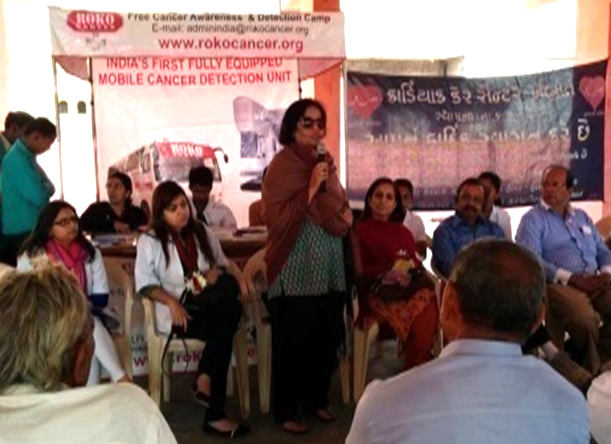 Roko Cancer Delhi team, comprising of the Director-Mrs. Murgai, 2 Doctors, Radiographer and 2 Camp coordinators went all the way to Gujarat for these camps. Roko’s Mobile bus traveresed rugged terrains all the way from Shillong to reach khambhat. The base was in Khambhat at the Cardiac Care Centre where the entire team stayed and was also one of the camp locations. The other 5 villages that were covered during the visit were Undel, Ralej, Bhamadva, Fatehpur Chokdi and Tarapur. Mrs. Jayshri Rami was one of the organizers and the key person behind these camps. To give medical support were Dr. Bipin Shah and Dr. Thakor Rana. We were honored to have the support of the entire Cardiac Care Centre team who were always there at our beck and call. Also to support the cause we had Rotary Club, Giants International and Saheli Group who took great efforts to make our stay comfortable. Cancer Awareness and Screening was done for Breast, Cervical and Oral cancer. Our team of doctors spoke at length with the masses and educated them on importance Self Examination of the Breasts, Lethal effects of Tobacco, the importance of Personal Hygiene, the hygiene of the family members and also their environment. At the camp Clinical Breast Examination was done for all the women and Mammography was done for all women above 40 years of age and to those who needed it. Pap Smear was done to screen for Cervical Cancer and Oral Physical Examination was done to screen for Oral Cancer. Doctors after examining hundreds of patients found many cases suspecting of Cancer. Maximum cases were of Oral cancer, which could be due to the rampant use of tobacco in several forms in that area. This can be attributed to the fact that this area of Gujarat has many tobacco fields which makes tobacco easily and cheaply available to the people of this area.